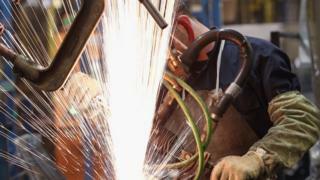 Scotland's productivity levels are "broadly stagnant" and lagging behind many other European countries, according to a new report. An independent policy think tank says a "concerted effort" is required if living standards are to improve. The study by The David Hume Institute claims there has been no progress towards a Scottish government target to improve productivity rankings. The Scottish government insisted the economy was "fundamentally strong". The institute's Wealth of the Nation report focussed on a key economic challenge facing Scotland - how to boost productivity. It found that for more than a decade, Scotland's productivity growth has all but stalled, despite a well-educated workforce. That has meant there has been no significant rise in wages. The study said political parties, business and trade unions must work much more closely to find evidence-based, workable solutions. The think tank stated there had been "no progress" towards a target set by ministers in 2007 to improve Scotland's productivity rankings. The report also said while the UK as a whole was "at the centre of a so-called productivity puzzle"' which had seen growth slump to "virtually zero", the slowdown had started earlier in Scotland. Although Scottish government capital spending has been above the UK average, the report added it still "lagged considerably behind other developed countries". Institute director Jane-Frances Kelly said "We are not the first country to face this challenge but - as our research shows - politicians and policymakers need to get their act together and make choices guided by evidence. Failing to do this will put the Scottish economy at risk. Public finance minister Kate Forbes said: "Over the last decade, productivity in Scotland has grown at more than three times the rate it has across the UK as a whole. "Our productivity growth has been higher than any other country or region of the UK, including London, with productivity increasing by 1.7% in the first quarter of this year. "Scotland's economy is fundamentally strong but we are determined to strengthen it further and will consider the points raised in this report." Tory economy spokesman Dean Lockhart said the study was "a vital and timely contribution to the single biggest challenge facing Scotland's economy - how to get higher wages and create more jobs by making our economy work better". He said: "It makes clear we must examine the root causes for low productivity levels - such as low business investment, lower than average exports, and declines in education standards." Jackie Baillie, Scottish Labour's economy spokeswoman said: "This is an important report that lays bare the scale of the SNP's mismanagement of our economy. "Productivity is vital if we are to grow the economy and improve Scotland's poor outlook - but the last time the SNP set a target to raise productivity, it actually got worse."